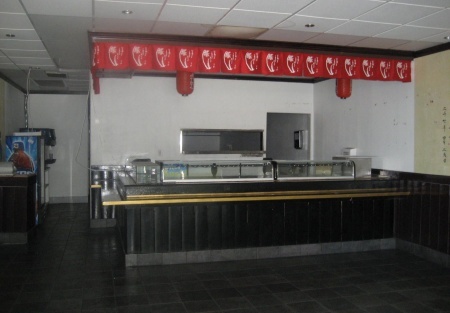 Formerly operating as a very popular Sushi restaurant, this location is ready for YOU! Keep it as before, or bring in YOUR own concept. Remaining inside is a very nice 15' hood vent system, stainless steel sinks, refrigerated front counters, tiled floors, and two bathrooms. (Beer and wine not a problem!) There is a nice sized dining area, well laid out kitchen, and a large office/storage room. This is a very high-traffic area with great street visibility. The residential area is very close to this location. This is a great Landlord to work with, and a new lease is waiting for you. This restaurant facility features 1,263 square feet of space. Base rent is only $1.15 sq ft. CAM is only .30 sq ft, for a low monthly rent of $1,831.35! This a perfect opportunity to be your own boss! Great Landlord and a New Lease! Base Rent $1,452 mo. Only $1.15 sq. ft.
CAM $378 mo. Only .30 sq. ft. There is already a smoothie/juice shop and a Thai restaurant in the center.